The iPhone represents a long history of a perfect combination of hardware and software. The iPhone 5S, in particular, was initially made public on September 10th, 2013, but was officially launched ten days later, on September 20th, 2013. It is now available in Dubai market too. While the phone has been reviewed some times (and on various platforms), we take on a whole new look at the iPhone 5S and see if it still stand against the latest popular ones in terms of specifications and price. Drawing a lot from its predecessor, the iPhone 5, the 5S was different in terms of design. However, the real difference lies in term of the technicalities (It can be upgraded to iOS v9). There were many improvements in the 5S, from Apple’s iPhone 5. It was an expensive device when launched. However, the price has seen a significant drop, thanks to the introduction of later models. Let us dive a bit deeper in its specification and reviews to see if the iPhone 5S deserves your bucks. The iPhone 5S was launched at a point where Apple had not considered making thinner phones. Hence the 5S was distinguishably Apple-designed, and nothing much different from the 5 in the design aspect. The 5S was a carbon copy of iPhone 5, with a few new colour variations. That being said, the device support a premium look, owing especially to the chassis made entirely out of glass and aluminum. The impressiveness gets extended when you hold the device too, and feels considerably light-weight, despite the premium metal finish. With the iPhone, the superiority in looks does not end with just the hardened body and metal finish. Additionally, the device will leave you awestruck with the precision that has been applied in the design. The aluminum rear is very smoothly cut and integrates seamlessly with the glass panels given on both sides. The edges are sharper compared to few other models in the market falling in the same segment, but the beveled edges are neatly formed, and hence make phone holding very comfortable. 5S was launched and made available in its previous year’s white/silver colour, or space grey, which looks good with the black glass and the darker looking anodized aluminium. But it’s also available in Gold. It’s not actually made up of gold and nor does it gives a golden look. It’s mellow gold, a champagne, or a light bronze colour, which is paired with white glass, at the front and back. Owing to the fact that the size of the phone remains the same, it also implies that the screen is the same as before. The screen dimension remains at 4 inches, with a resolution of up to 1136 x 640 pixels. Larger screens weren’t introduced until the iPhone 6 series, but it still felt smaller in comparison to several Android phones at the time offering 1920 x 1080 pixel resolution. Nevertheless, the small screen offers a pixel density of 326 pixels per inch (officially labeled Retina Display by Apple). This allows the users to look at the items on the screen without seeing any pixelation, even from a normal distance. The reproduction of images on-screen is excellent too, as is the lighting, reproduction of white and other colors, and the IPS panel in the device makes it one of the best smartphone screen displays in the world. A notable feature in the phone is the architecture of the system itself. The iPhone 5S was one of the first devices to support 64-bit mobile CPU. In the simplest terms, this has a significant role to play in the device’s performance. Owing to its support for 64-bit architecture, the iPhone 5S lives to its promise of improving efficiency and speed when accessing applications, regardless of whether they are 32-bit or 64-bit ones. The new architecture also paves the way for developers to port their existing applications or develop newer ones based on the 64-bit system. The data released by Apple shows that this new architecture will considerably enhance the speed (double, is what the company said in its statement) at which apps and graphics are accessed. Well, the results weren’t exactly as predicted, but were relatively close. For instance, the iPhone 5 unit we tested, it took 708.6ms for test completion, whereas the 5S completed it in 416.2ms. Another interesting scenario was encountered when the device was tested on Ice Storm Unlimited. The unit scored a whopping 14,506, and unambiguously reserved a spot for itself amongst the best Android devices around. The M7 Motion Co-processor is another advantage that comes with the device, making your smartphone, well, smarter. The co-processor is hardware that consumes relatively less battery power and collect data from the in-built sensors and compass. This process goes on even when the phone is sleeping. Hence all the data is kept ready for the main processor when it wakes up. A simple glance over the phone’s specs will reveal that Apple uses the same 8MP camera in its 5S, as was the case with the iPhone 5. However, inside are the hidden wonders that make this unit better in terms of price and specifications than its predecessor. While the 8MP resolution has been maintained, the iPhone 5S supports a sensor which is 15% larger than its previous version. It implies that the pixels are bigger, and thus the photos shot in low-light conditions are better. This, in combination with f/2.2 lens also means that photos have more detail, even when shot in relatively darker conditions. Images taken during day light are vibrant and detailed, and color reproduction is impressive. An added feature to the iPhone 5S is the inclusion of dual-LED true tone flash. Using this technology, say goodbye to the times where images supported a strange color cast or even display unnatural skin tones. The rear camera can shoot 1080p videos (which are pretty good). It even features a Slow-Motion mode that can record 720p videos 120fps. The secondary camera, called FaceTime, features a 1.2MP unit. This is not much but handles its role quite well. The music player faces a slight change and does not feature its usual cover-flow mode. Instead, it now sports the album cover grid layout. The other functions pretty much remain the same, although the addition of iTunes Radio does come as a much-awaited feature. Copying multimedia, especially video files, remains to be somewhat time-consuming, given the fact that these files require conversion before being copied. Now, there’s nothing to complain about the playback of HD videos (they run flawlessly and without any glitches), although the experience would have been more immersive if the screen had been bigger. The iPhone 5S features a non-removable 1560mAh battery which seems to be quite okay. In combination with the new M7 Motion Co-Processor, and also due to the fact the phone simply has a slightly bigger battery than the iPhone 5. The device offers significantly better battery performance in this price range. There is a host of connectivity features available that include Wi-Fi a/b/g/n dual-band, as well as hotspot. It also supports Bluetooth version 4.0 and A2DP. It also includes USB2.0 and a reversible connector for easy charging and connecting. The iPhone 5S has its perks, as well as it requires improvement in quite a few areas. The camera quality of iPhone 5S is better than expected, and along with a nifty fingerprint sensor and a next gen CPU, it surely gives a sparkle to the eye. Motion tracking chip is another welcome feature from Apple. The iOS 7 looks much better than its predecessors, and it adds some nice step-ups too, which includes AirDrop file transfers and the Control Centre, which is very similar to that of Android. Apple does gives away iWork app suite for free with the iPhone 5S, but all this can’t hide what the bad part about this phone. Firstly, the look. The look is very identical to that if the iPhone 5, that includes the display screen. The display screen is a mere 4 inch in size, which doesn’t look much competitive with Apple’s head to head competitor Android phones. Fingerprint sensor is a nice addition, but it only works with Apple apps, which makes it almost unhelpful. The 64- bit A7 processor and the M7 motion tracking chip is quite worthless as well, because there aren’t many or should I say, any app which can utilize its presence. Also, iOS 7 differences are potentially jarring for long time iPhone users. Apple iPhone 5S is not quite the upgrade people would love to have. Yeah, it is easily the fastest and the most advanced Apple smartphone after its predecessors. But for the same amount of money, one could get a way better smartphone, with many more features than Apple iPhone 5S. Also, it’s no more a flagship phone from Apple. There are better versions of iPhone available in the market right now, but if you are an Apple fan and don’t have much money to buy the all new iPhone 7 or last year’s iPhone 6s and you can manage with a few drawbacks, you should go for iPhone 5S. When was iPhone 5S released? The phone was officially announced as available on September 20, 2013. What makes this Apple product so special? 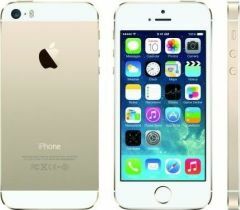 The iPhone 5S was the first Apple device to use feature Touch ID and A7 processor. Additionally, it was the first smartphone to come with a 64-bit architecture and featured iOS7 right out of the box. Is LTE Advanced supported in this phone? No, the 5S does not support LTE Advance, and neither does its predecessors. This technology is only supported in iPhone 6 and above. Is Apple Pay integrated with my iPhone 5S? Sadly, no. Apple Pay requires the use of compatible hardware, and these have only been integrated in the line-up of iPhone 6 and above. However, owners of 5, 5C and 5S can use Apple Watch for making payments via Apple Pay. Does iPhone 5S feature earpods? Yes, the 5S comes with redesigned headphones (called earbuds) which not only improve airflow for better sound, but also work as a microphone and remote audio control. How much do extra ear buds cost? They are not charged separately. They are shipped as standard accessories with the iPhone 5S. What are the camera specifications of this phone? Are they any different from the 5 and 5C? Yes, camera in iPhone 5S features a larger image sensor than the previously launched models, and also has a bigger aperture. The rear camera is an 8MP unit, capable of recording 1080p HD videos at 30fps. The front camera is a 1.2MP unit, and can record 720p videos. If I use the Touch ID, will Apple store my fingerprint data? The official Touch ID statement clearly says that fingerprint data is encrypted in a chip in the phone itself, and never ever makes it to Apple servers, and cannot be used by any other software too. Can I use the Touch ID to make purchases online? Apple currently allows only making purchases on the Apple store (iTunes, iBooks and the App Store), but this limitation could be removed in future. Which model features a better camera – the iPhone 5S or SE? The SE comes with a better unit, featuring a 12MP iSight camera which has also been employed in the 6 and 6S. How many fingerprints can the Touch ID store in this phone? Official reports suggest that 10 individual fingerprints can be stored in the Touch ID, however, there are a few unofficial tweaks in the market which allow you to save significantly more of them. Can the iPhone 5S be jailbroken? Yes, there is now support for jailbreaking the iPhone 5S and other 64-bit devices running on iOS7. Does the iSight camera in this phone support optical image stabilization? Unfortunately, no. OIS (optical image stabilization was only introduced by Apple in devices like iPhone 6, and later models.